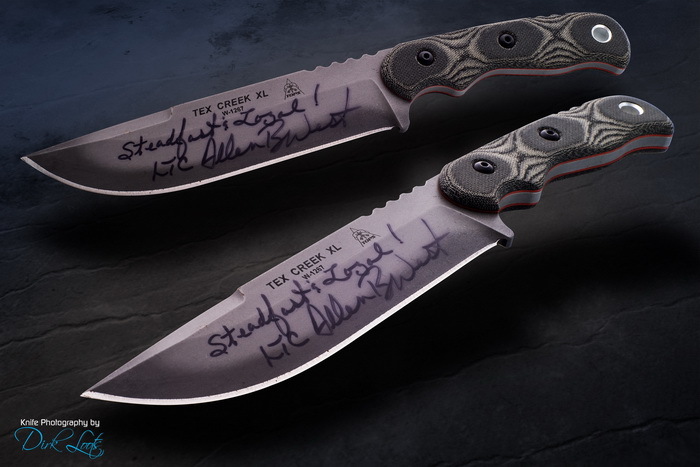 TOPS Knives TEX CREEK XL autographed by Congressman Allen West (U.S. Army LTC retired) PLUS another (unsigned) TEX CREEK XL to use! One for SHOW, One for GO! The Tex Creek Hunter XL ($205) is a fine example of a high quality, good looking "working knife." Designer Leo Espinoza created a new look on this specific blade. At TOPS, we call it "Black River Wash." The uncoated finish clearly shows the heat treat line along the blade edge. The darkened-steel pattern is unique on every blade. This creates that “broken in, rustic look” and feels just like an old pair of comfortable boots. The darkened Micarta scales are screwed onto the handle and a large cord holder is accentuated at the back of the handle. The handles are designed and built for a positive grip and for extended periods of use. A simple and useable design is reinforced by a sturdy 3/16” thick blade and full tang handle. "This is a knife that performs with excellence in the field and looks and feels like an old trusted friend, anywhere that you go."